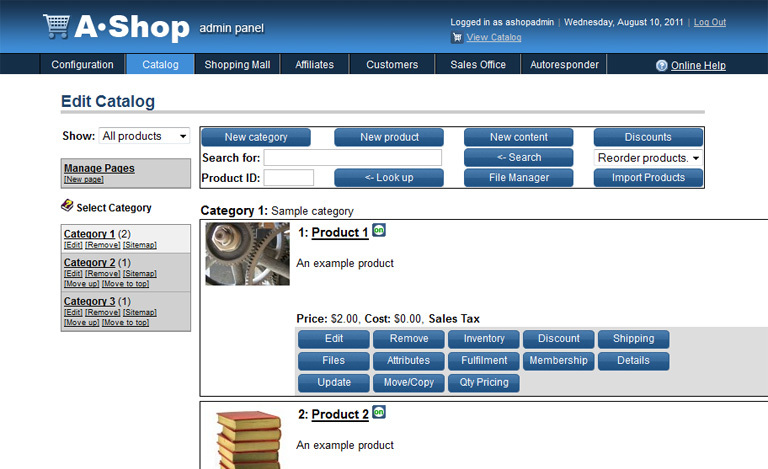 AShop Deluxe is an advanced shopping cart application that is meant to be installed and run on a web server. - Support for many payment gateways, such as PayPal, Authorize Net and 2Checkout. - Unlimited payment options can be created. Processing fees can optionally be added to each payment option. When more than one payment option exists, customers have option to select method of payment. - Separate retail and wholesale catalogue with reseller signup. - Shopping cart catalogue with categories and sub categories. - Flexible adaption of layout through html templates or use static html pages together with your shopping cart. - eBay stores can link to the shopping cart checkout system to process payments and provide secure delivery of digital products. - Terms of sale or license agreement optionally set for each product. Agreement checkbox required for purchase. - Product attributes. For instance; selection of color, size, etc. for each product. Each product attribute alternative can be set as taxable, downloadable, or shipping. Product attributes can also be used for customers to enter comments for each product ordered. For instance; inscriptions, custom labels, or a comment specific to each product ordered. - Customer's IP address is recorded for each order and included in the administrator's e-mailed order notice. - The shop can be set to use either US Dollar, GB Pound or Euro. - Calculation of shipping with a choice of several different methods for each product. - A discount coupon code can be set for each product by a percentage or amount and can be optionally tied to an affiliate.